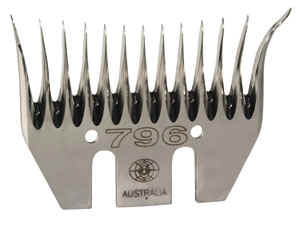 • With its extra long 7mm bevel, ultra fine tooth profile and 96mm width, the 796 will handle the toughest shearing Merino sheep. A run-in comb for the shearer who wants to maintain his tallies each day. For the professional shearer shearing top tallies in average Merinos.